The foreclosure crisis is affecting victims in an unlikely community – the summer playground of the wealthy: the Hamptons. Town investigators from Southampton say they have identified nearly 50 homes in their town, that are at various stages of foreclosure. But what makes these properties unique is that families are paying rent to live there. "I've been in one family home where fifteen people were living inside," said town investigator Ken Glogg. Glogg and fellow investigator Ricardo Larios took the I-Team on several home inspections, and documented overcrowding, too many cars in driveways and poor property management. Perhaps more stunning was that they were unable to pinpoint the owners of many homes. "There's no real owner," said Larios. "So if the tenants have problems, they tell the person they give the rent to, but it won’t get fixed." Glogg added, "We would write a violation order to the owner but in this case, who do we write?" One house, on Majors Path in Southampton, had been in the process of foreclosure since 2007. It's owner of record is a man who has been in prison for his involvement in an $82 million dollar mortgage fraud scheme. But tenants living there told the I-Team they'd been renting the home from a man named Bobby for three years, writing out checks each month to "cash." At another home on Shinnecock Hills Road, tenants too said they'd been paying rent to the same Bobby -- officials identify him as Robert Mazzone -- for the past four years. One of the women living with her extended family in the house said she received a notice that the house was in foreclosure and is worried that she'll be forced to leave. The woman, who asked only to be identified as Gladys, said she lives in one bedroom with her husband and two children. "I need enough rooms for my entire family," she said. Mazzone was recently charged with renting homes in the town without a permit. 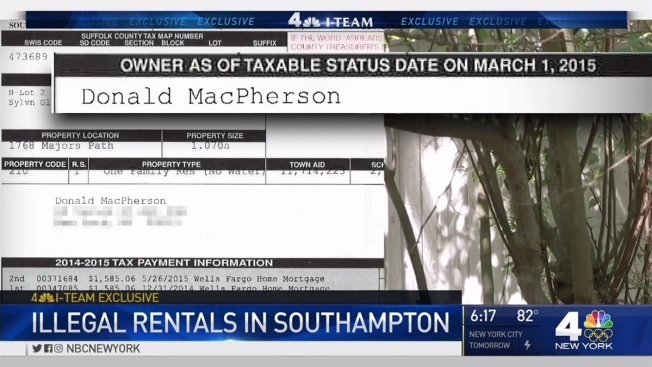 When the I-Team reached out to his office, a man named "Bobby" answered the phone and said that Mazzone used to rent "used to rent the homes out a few years ago, but not now,” and that he didn’t know who currently owns either house. The man didn't refer the I-Team to an attorney for Mazzone for comment.